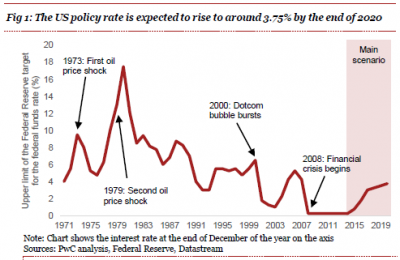 Fed Ready to Raise Rates – What Will be the Impact on the US and Global Economies? News from Members Fed Ready to Raise Rates – What Will be the Impact on the US and Global Economies? One of the biggest economic events of 2015 is likely to be the US Fed hiking up its policy rate later in the year, say PwC economists. Assuming this happens, its importance lies not only with the impact this will have both within the US and globally; but it will also be symbolic, since the policy rate hasn’t increased for almost a decade. The PwC analysis assumes the Fed’s interest rate will hit 3.75% by the end of 2020 (see Figure 1). But what will the impact of that be on domestic households and businesses – and, indeed, on emerging markets? 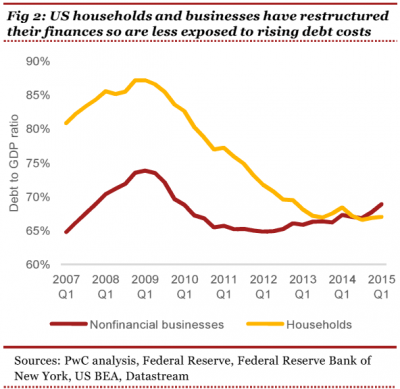 Households: In the years following the financial crisis, US households have reduced their dependency on debt (see Figure 2) and PwC’s analysis suggests that they will be largely shielded from Fed action. The vast majority of homeowners have hedged against future rate rises through fixed rate agreements. Assuming real wages continue to grow, aggregate household disposable income will remain largely unaffected by tighter monetary policy. Businesses: There is some evidence which suggests the financial crisis changed the capital structure of companies. For example, Figure 2 shows business debt has dropped from 73% of GDP at the end of 2008 to 69% today. At face value this suggests business activity is less sensitive to the Fed’s policy decisions. The bigger implication on US businesses is expected to be felt via the dollar rising, which makes local goods and services more expensive on international markets. Emerging markets: The expectation of higher policy rates in the US has already had an impact on the value of the dollar, which has increased by around 19% in trade-weighted terms since July 2014. This is a worrying sign for some emerging economies that have binged on cheap dollar debt to fund either large scale investment projects or consumption. Turkey is particularly vulnerable to a strong dollar while other large emerging markets, such as Brazil and Indonesia, are worth keeping an eye on. PwC helps organisations and individuals create the value they’re looking for. We’re a network of firms in 157 countries with more than 195,000 people who are committed to delivering quality in assurance, tax and advisory services. Find out more and tell us what matters to you by visiting us at www.pwc.com.